Yo! I can't believe the first week of #30DaysofDope is over that quickly! I guess time flies when you're tryna be excellent, eh? Here's a quick pulse check on ow the first week went for me. If you got my e-mail this morning, then just reply to that or hit me at christina[at]30daysofdope.com to let me know how you fared this first week! Reading The Four Agreements is really taking me on a journey to confront some of my own challenges, forreal. I mean, the first agreement alone - be impeccable with your word - is heavy. This ain't no "word is bond, son" type deal either. Being impeccable with your word is about realizing that your words have power - and with that power comes responsibility. We have to monitor closely the things we say to others, to ourselves, and that others say to us. Now, before you haul off thinking I'm all high and mighty and got it together - let me tell you I struggle with this daily. Most of the time, I'm even-tempered, easygoing, and can carefully craft my words so as to not be hurtful or rude. All of that goes out the window when I'm driving. I'm sure you've heard the stories about traffic in LA. And the road rage. It's all true - times a million. And because of this, I find myself driving for what I like to call "maximum efficiency" - getting from point A to point B and back to point A avoiding traffic as much as possible. In my errand running Tuesday morning (FedEx, Costco, Trader Joe's), I found myself in a verbal altercation of sorts. Long story short, this dude swung out onto the street and almost hit my car. As I honked and swerved to avoid him, he proceeded to edge alongside me and hurl expletives at me - as if the incident was my fault. I could have ignored him. But I didn't. I REALLY wanted to hop out of my car and see if he was about that life, but it's a new season and God is working on me. But I did get caught up in the moment and yelled right back. Normally, I would have driven off in a huff, and muttered to myself about where I'd like to stick my foot, but instead I found myself praying and asking God to forgive me. Because I know better. I'm supposed to be doing better. And that's what this is about. Knowing, doing, and being....better. My mini goal for the following week? I'm gonna stop cussing people out (loud) and in my head while driving. Pray for me. No seriously - please do. The road rage struggle is real. 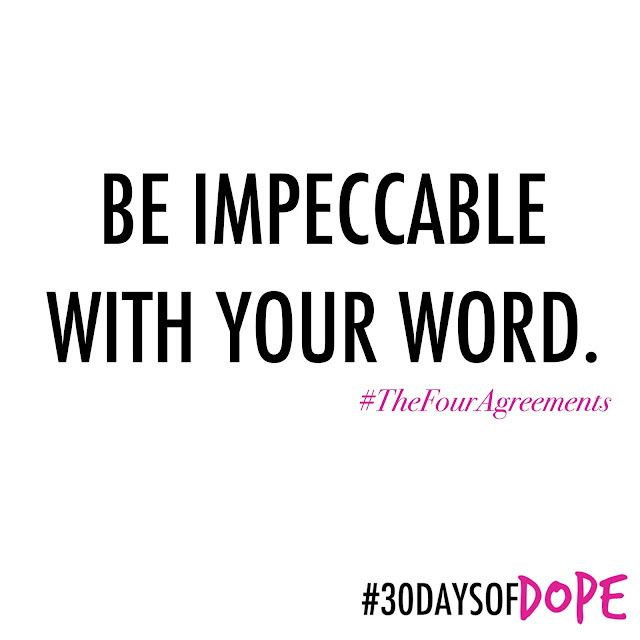 For a little more in-depth discussion about The Four Agreements and how it relates to the #30DaysofDope journey, check out the e-mail I sent this morning. Oh, and if you're not on the list - drop your e-mail addy in the pink topbar above. Don't worry - I don't e-mail my #DopeFam annoyingly. Okay, can I just say that meal prep is a gift from the heavens above? I'm sure you're looking at me like I'm tripping somethin serious. But hear me out. My single biggest challenge with #30DaysofDope during the July cycle was food intake. I started off then, simply by measuring portions. But alas, I discovered when I got a meal plan, that I was eating too many carbohydrates. And that was simply because I loved carbs in all their forms - bread, pasta, rice, chocolate... you get the drift. 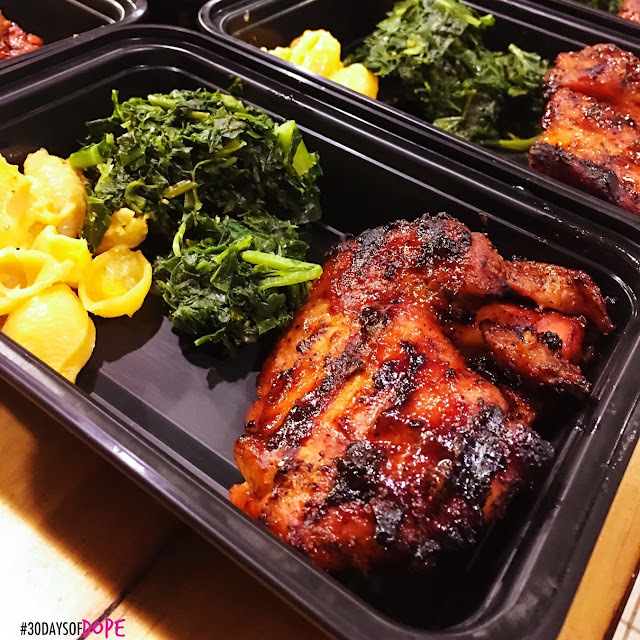 In my meal prep, I aim to be low carb and high protein to meet my fitness goals. And so far, so good. If you follow me on Instagram, or my other blog snapchat (maneobjective) then you've seen #mealprep in action. I literally cook whatever I want - just modified (if necessary) to fit my macros. One of my favorite recipes thus far has been the Low Carb Chinese Chicken & Broccoli Stir Fry - because it's easy, flavorful, and gives greasy Chinese takeout a run for its money. Click here for that recipe! Also, I can't express how clutch my Neocell Collagen Sport protein powder has been. 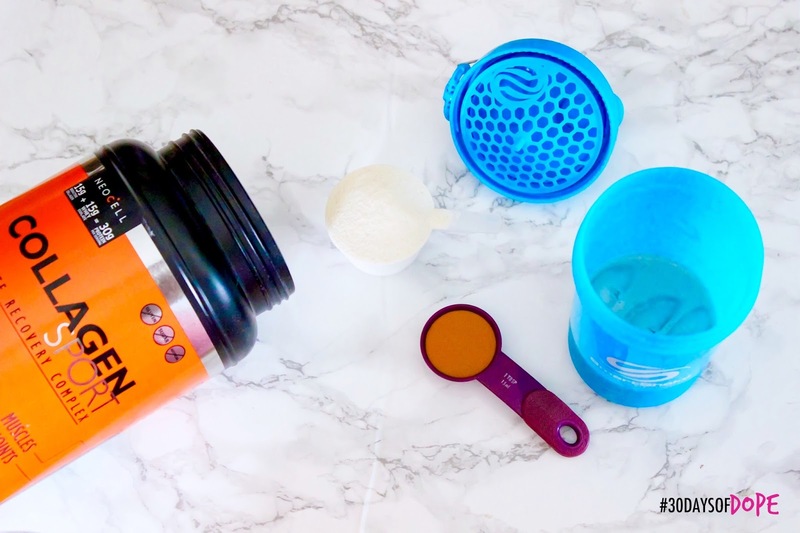 I talked about why I love this protein so much, and the benefits of collagen for hair, skin, and body in depth here. And I even shared an easy Protein Caramel Iced Coffee recipe. Most days I need it, just to get to my protein goal. It also makes an amazing quick breakfast option (as I shared here on Instagram) for those of us who actually struggle to eat a decent breakfast - or eat breakfast at all. 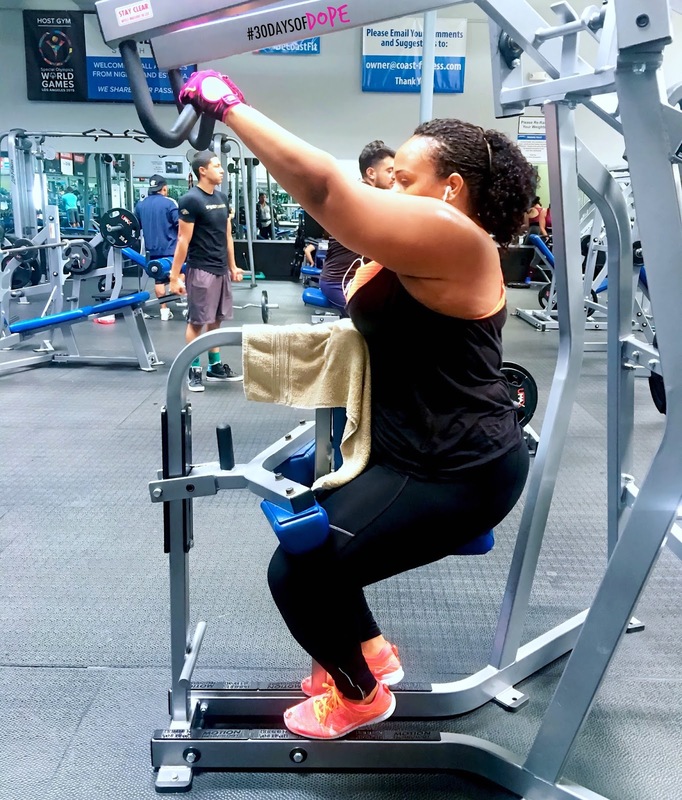 As far as the gym is concerned, my workouts have been consistent. To be completely transparent with you all, I'm in the process of breaking out of a place of complacency. I do this weird thing in the gym sometimes. I'll struggle initially with something like, running 30 second sprints. Then I'll get to a place that feels good - like I'm in control and not about to pass out on the gym floor. So I keep doing that, never moving the speed, incline, or even length of time running up (or decreasing the rest time). Essentially, I get comfortable where I am. And I stay there. I kid you not, I took me the entire first week to realize that I'm in one of those comfortable zones right now. The good news is yesterday (literally day 7), I started the process of breaking out. Upping the ante. Stepping faster on the stairmaster (my frenemy lol). Doing the extra 2 reps. Making sure with each exercise I was challenging myself - either by doing heavier weight, more reps, or perfecting my form. But the kicker - without having my mind right and telling myself that I was more than capable, I couldn't have done it. That's that mind-body connection for ya. One of the habits I developed during the July #30DaysofDope cycle was that of just talking to God. Not putting on some liturgical dance, or using a bunch of lofty words - but literally just talking to God. Asking Him to guide my day. Talking to Him about whatever was on my heart. Asking Him to cover and keep my loved ones. As that habit continues, I find myself looking at His word a little differently. Not just as a scripture to commit to memory - but really deep diving for understanding. That's why I'm in no rush to move through the Before The Cross: Fruit of the Spirit devotional. I've read through Love and Joy, and I'm going to go back and read them again. For understanding and application. One of ways I know God is working, is by confirmation. As I worked the devotional and scriptures about Joy, I found myself smiling and nodding in church on Sunday - because guess what the sermon was about? Getting your hope back. Getting your joy back. It gave me goosebumps. Well, that about wraps up week 1. Sorry this post was so long - I'm sure they'll get a little shorter as the weeks go on. Oh - and don't forget to tell me how things are going on your end, I wanna know! Drop 'em in the comments below - or e-mail me at christina[at]30daysofdope.com.